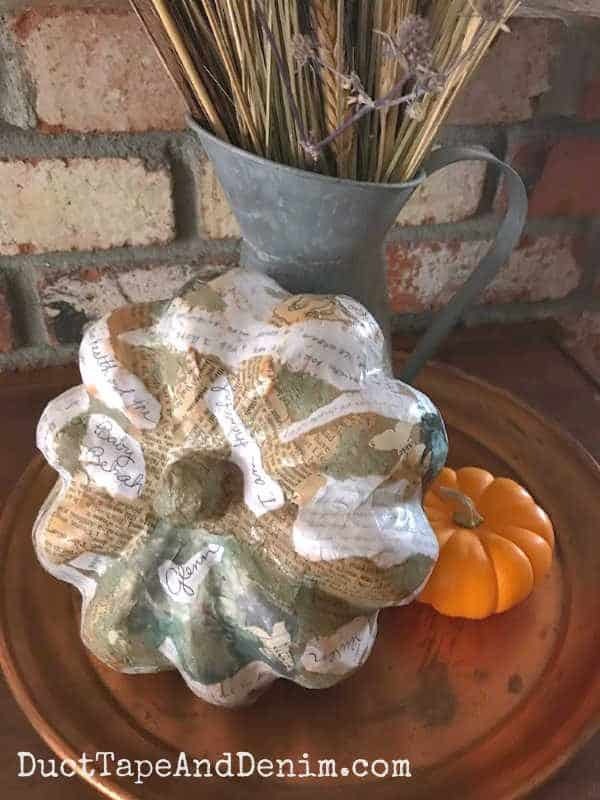 Y’all already know that fall is my favorite and that I could make pumpkin crafts all year long! 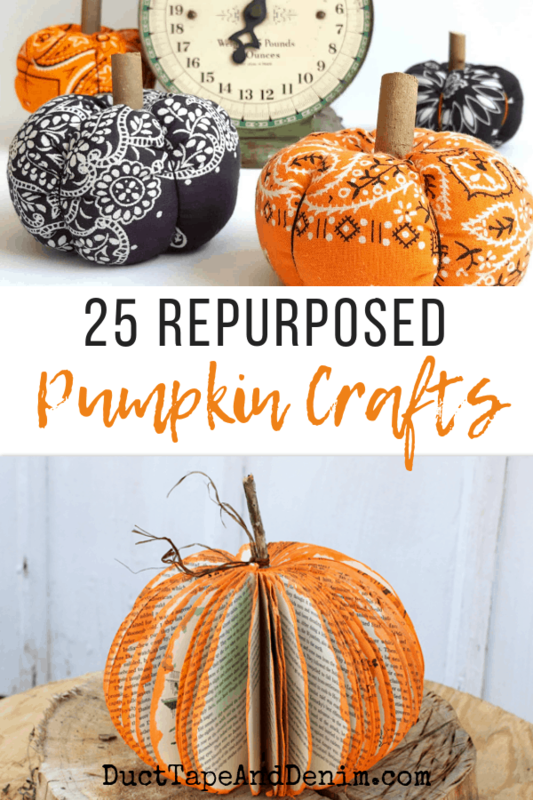 I’ve got 21 repurposed pumpkins to share with you today, but I could go on and on. I may add more later! Sign up for our thrift store makeover newsletter and get your own printable copies of “25 Things You Should ALWAYS Buy at Thrift Stores”, “Top Ten Thrift Store Tips”, + MORE bonuses, & all our upcycled projects sent straight to your inbox. This was my favorite project from last year. I find Jello molds all the time at thrift stores and garage sales. They’re usually pretty cheap and easy to spray paint. 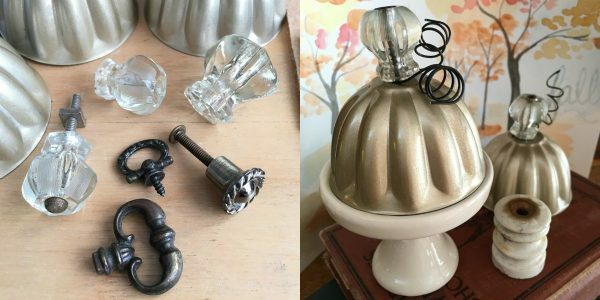 I used up a lot of other little “junk” that I’d been collecting, too – knobs, handles, wires, screws, etc. Pretty much anything can be turned into a pumpkin! This was a special pumpkin. It’s covered with memories! Check out the full story and see how I added so many special pieces to my pumpkin. 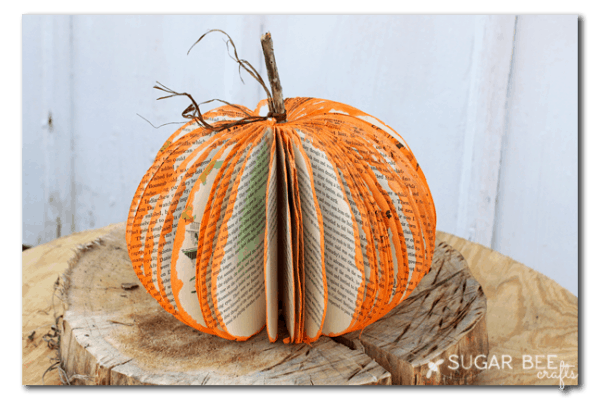 I haven’t tried this one yet but paperback books are easy to find at thrift stores… you could make a whole pumpkin patch out of old books! 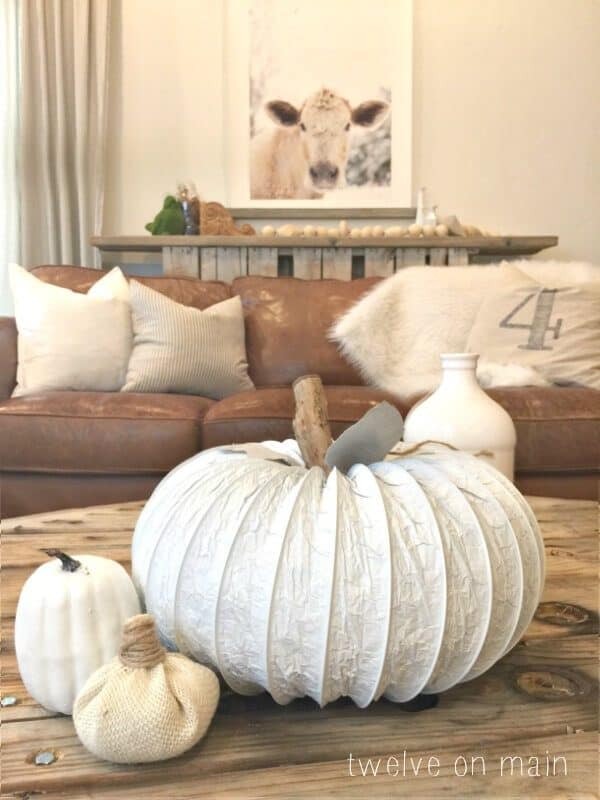 And skip painting the edges if you prefer a more neutral fall decor. I’ve seen mason jar lid pumpkin before but they’re usually spray painted. I thought this one was a little cuter. 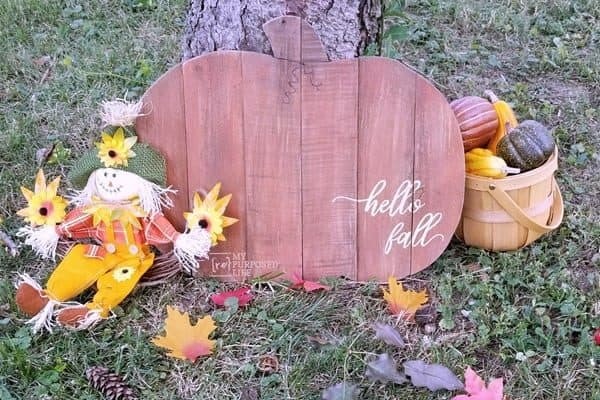 This hello fall pumpkin sign might be a little more work but wouldn’t it be cute on your front porch? Got any orange bandanas around? If not grab a few online. Now I want to turn every piece of wood I find into a pumpkin! It doesn’t matter what size or shape it is. Paint it orange, put a stem on top, and it’s a pumpkin. 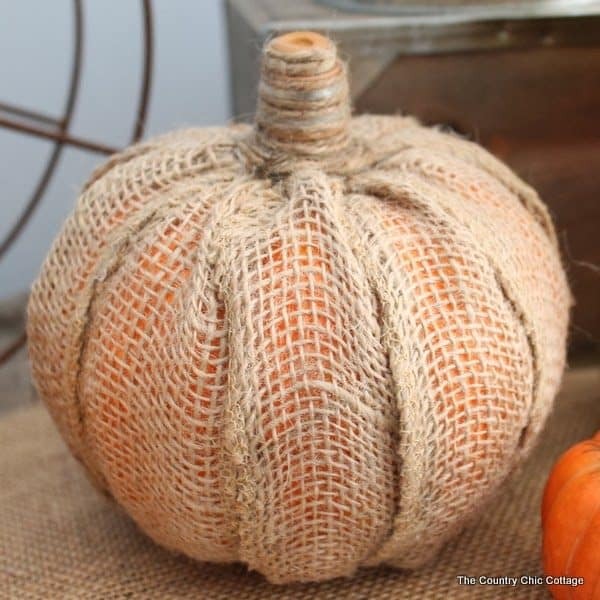 Burlap just screams fall to me so of course it should cover a pumpkin. Angie shared an easy way to add the fabric on her blog. Ya know all those broken crayons you keep saving? Here’s what you should do with them! You could do this on a real pumpkin or a fake one. 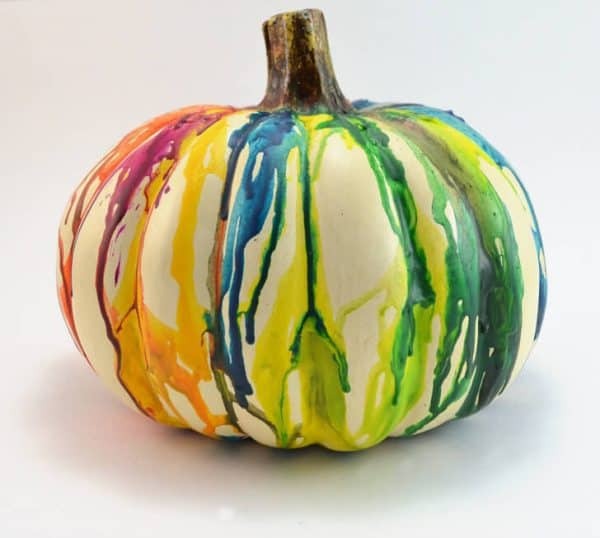 Make a pattern with the crayons or use one of each color like on this pumpkin. 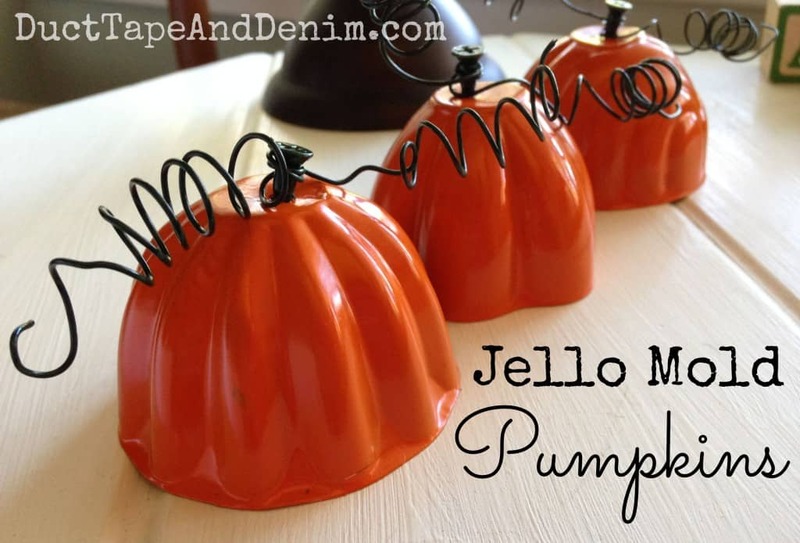 This was my first attempt at upcycling a Jello mold into a pumpkin… YEARS ago! 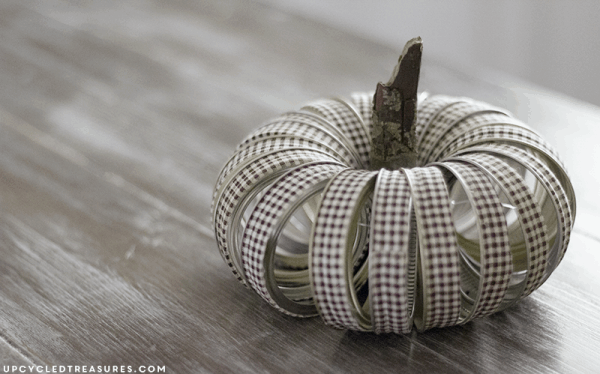 Yes, I love pumpkin crafts and could do them all year long… so please share your ideas with me, too. 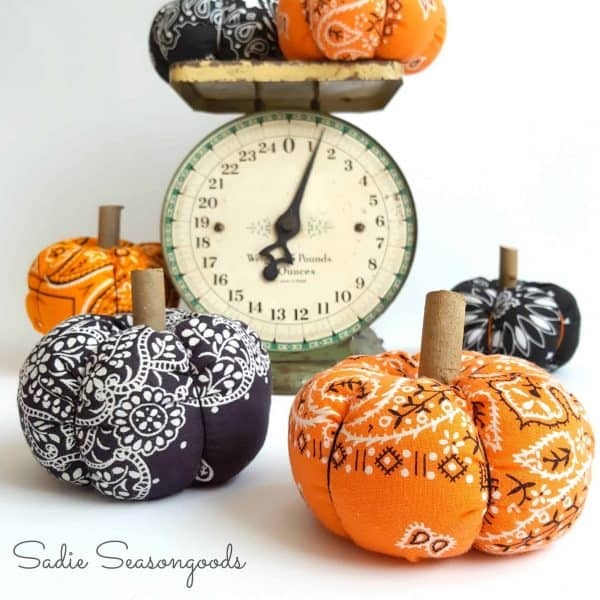 Leave a comment and let me know what kind of repurposed thrift store finds you’ve turned into pumpkins. We share at these blog parties. Very fun ideas! Love a good re-purpose!! Visiting from Sundays at Home. Such cute ideas. Thanks for sharing on To Grandma’s House We Go! 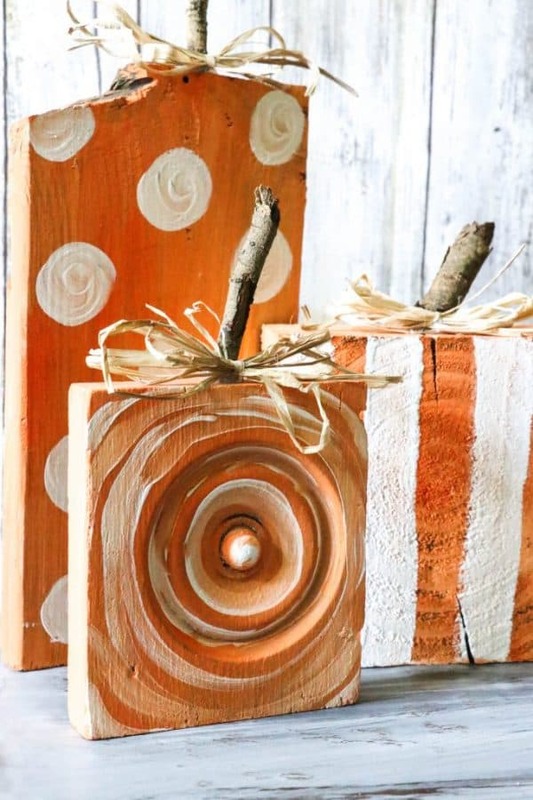 Such great ways to upcycle in festive manner!